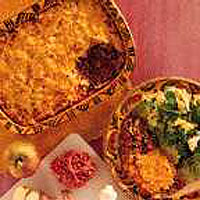 A variation on cottage pie, this version includes pork, apple and mushroom with a grated potato and cheese topping. Enjoy the pie with a glass of cider to echo the flavour of the apple. Season the pork well with salt and pepper. Heat the oil in a large frying pan and fry the ground pork, together with the onion and garlic, for about 4-5 minutes. Add the mushrooms and apple and continue to fry for a further 2-3 minutes until mushrooms start to soften. Add the flour and cook for 1 minute. Add the tomatoes and stock, reduce the heat and simmer for 15 minutes. Transfer mixture to an ovenproof dish. Place the rösti in a bowl, break up with a fork, then mix with the cheese. Sprinkle the mixture evenly over the top of the pork. Place in a preheated oven 200°C, gas mark 6, for 35-40 minutes, or until thoroughly cooked, there is no pink meat and the topping is golden brown. Serve with salad leaves and crusty French bread.